The return of King and Queen Tut aid Jimmy in escaping a desert he was failing to cross, while trying to find Bizarro. Meanwhile, in Metropolis, Superman has a heart-to-heart with Bizarro, helping him to realize that his actions were just as unfair as Jimmy's. However, Queen Tut presses her will to do wrong, resulting in the formation of the Bizarro League. The League... well, really only Colin, stop Queen Tut and she returns to her desire of being an artisanal chocolatier, while Jimmy and Bizzaro complete their road trip to Bizzaro World i.e. Canada. However, they're stopped at the border and denied entry, being sent away with the best Molson and Tim Hortons, Canada has to offer. The duo returns to Metropolis for what is not the end of their adventures, but the beginning... maybe. 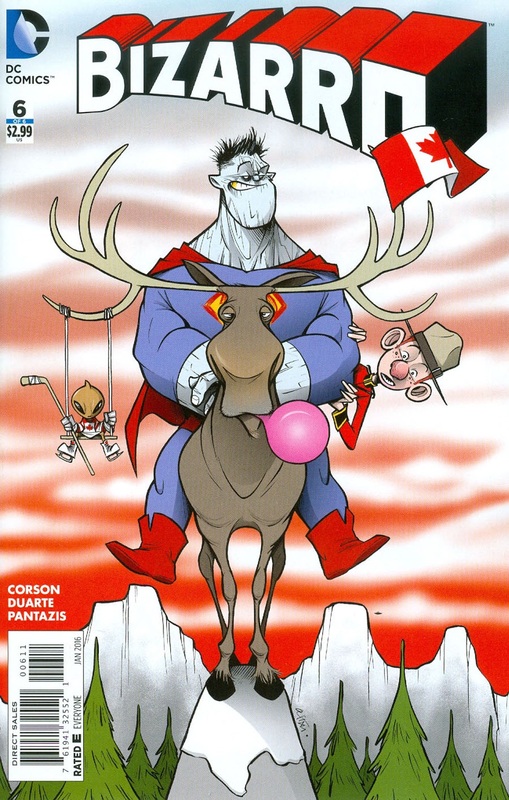 Here is a listing of the Bizarro title from its introduction with issue #1 in June 2015 to its conclusion with issue #6 in January 2016. The Writer, Penciller and Inker for each issue are listed within the Comic Index pages, directly below each title's name and number. Note: Remember, the dates listed for printed editions are from the issue covers, not the actual date when the comic was on sale.